Happy Lunar New Year from Nom Nom Cat! Chúc mừng năm mới, everyone! We’re taking a quick break from our One Week, Three Cities series to wish you all a very happy Lunar New Year. It’s the year of the dragon (my zodiac year!) and we are looking forward to a fantastic 2012! Lunar New Year is also known as Chinese New Year, which is a bit of a misnomer since many Asian cultures celebrate this time of year with their own festivals, traditions, and customs. This past weekend, we visited my parents for an early celebration of Tết, the Vietnamese word for Lunar New Year. I think being festive must run in the family, because every year, my parents always pull out all the stops to have a traditional Tết dinner with all the fixin’s. (Note: like many words in the Vietnamese language, and much to my dismay, Tết is not pronounced the way it looks, but more like the sound of a book falling from a table – thud. Not the best way to describe it.. maybe I’ll record a sound clip). This time of year, the supermarkets are extra crowded with throngs of people making their new year preparations. Anticipating the rush, my parents plan out the details weeks in advance. First, the mứt (dried fruit and nuts). Assorted mứt. Top row: mãng cầu (often translated as soursop or custard apple), peanut and sesame "brittle" and candied peanuts, bí (dried winter melon). 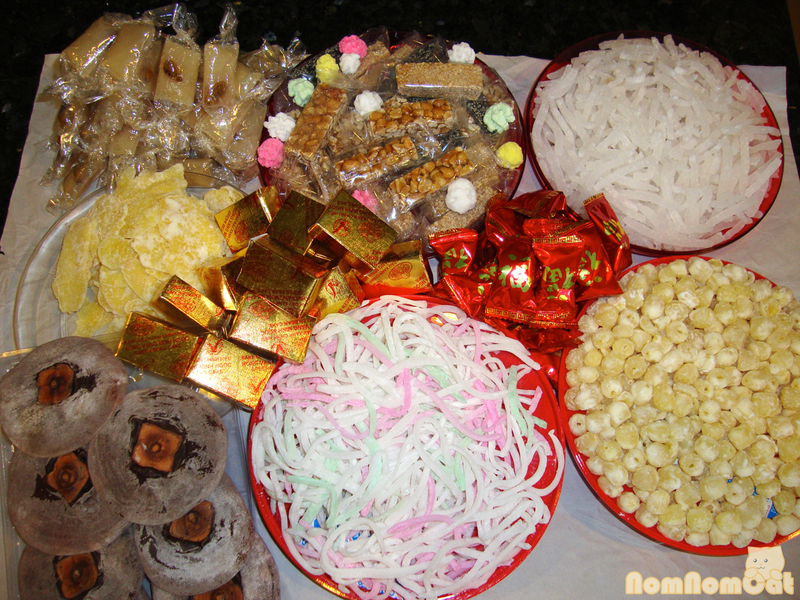 Middle row: gừng (dried ginger slices), bánh đậu xanh (mung bean cakes in the little gold boxes), lucky candy (hard candy in red wrapping). Bottom row: trái hồng (dried persimmon slices, mứt dừa (dried coconut strips), hột sen (dried lotus seeds). Of course one of the pivotal parts of most family gatherings is the meal. My mom prepared a traditional dinner of thịt kho (braised pork belly and eggs) and my dad made the pickled bean sprouts to go with it. 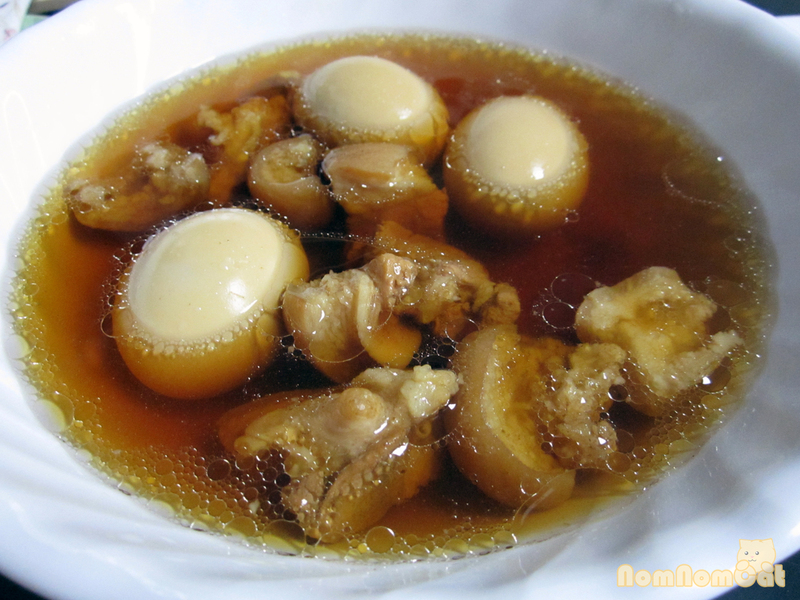 During the rest of the year, this is a common dish and is often served with rice. However, for Tết we like to roll the meat, veggies, and vermicelli into spring rolls. Sorry there’s no photo of the assembled spring roll – we were too eager to devour all the delicious food! Also finding space on the dinner table was bánh tét. Martin’s mom ordered these for us from a local mom & pop business, so they were handmade and fresh. 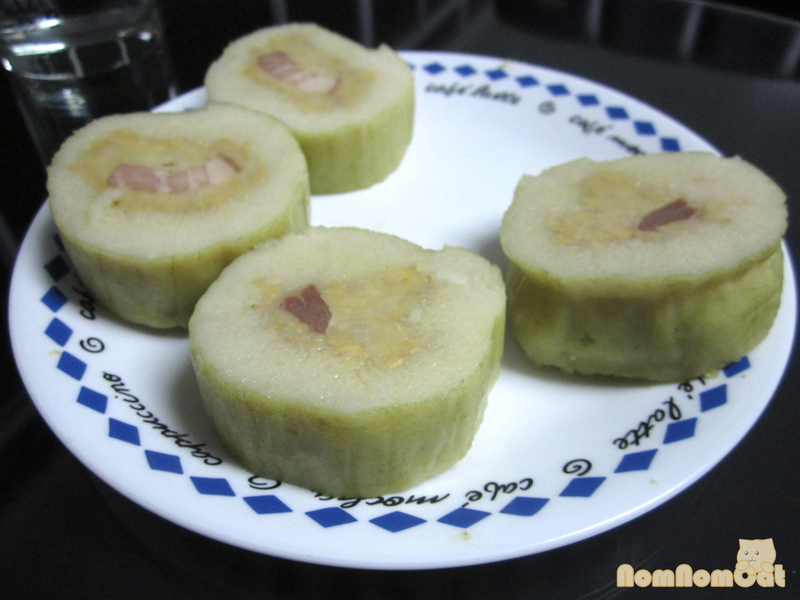 The center features a slice of pork belly and a mung bean paste, surrounded by sticky rice and covered in banana leaves. The bánh tét is then steamed and ready to serve as is or sliced and fried into fritters (I will post some of this later this week!). 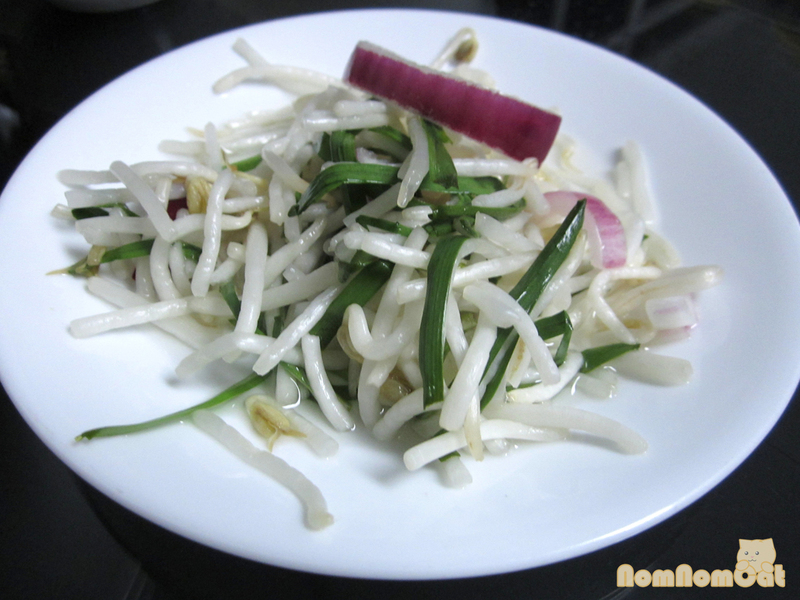 You can eat it by itself, but it’s even better with my dad’s củ cải (dried radish strips reconstituted in a fish sauce pickling solution — tastes better than it sounds, I promise). At the end of the evening, we wished my parents a year filled with prosperity, good health, and happiness. 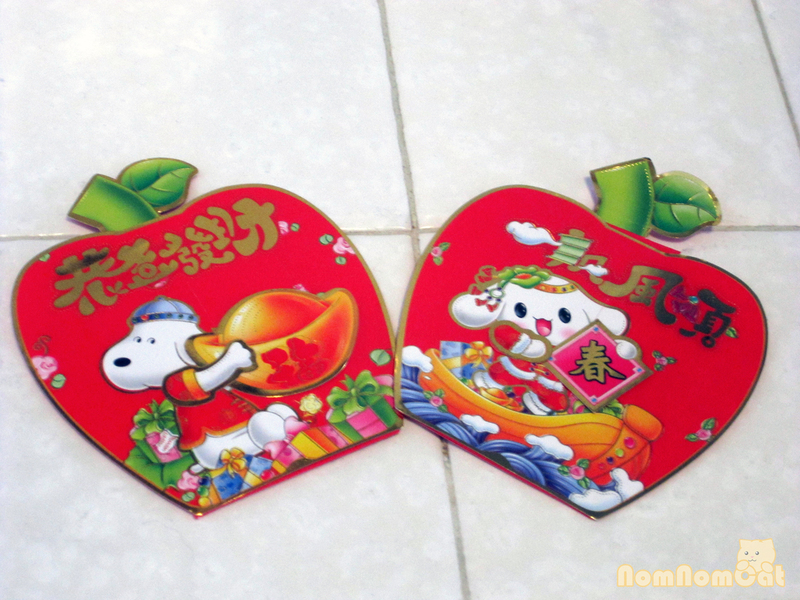 In turn, they gave each of us a red envelope of lucky money (lì xì). The amount is irrelevant as it is (pardon the cliché) the thought that counts, but younger children tend to receive more lucky money from their parents, relatives, and family friends. We know we used to score big when we were younger and cuter! 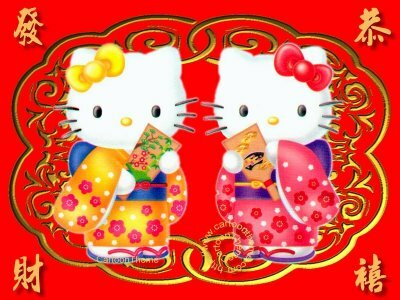 However you intend to celebrate the Lunar New Year, if at all, we hope you all have a great 2012 filled with fun, friends, and family. We hope our entry was informative and please let us know if you have any questions or would like for us to elaborate on any aspect of Tết or Vietnamese traditions and we will do our best to help! P.S. : In case you missed our posts on Twitter and Facebook, Martin and I were featured in a new column on Greatist.com regarding health and fitness in relationships. Check it out here! We love how it opens — “What happens when a girl who loves to cook meets a guy who loves to eat?” Many thanks to Kelly for the interview and article!